A little over 6 months ago, Mike and I loaded up his Land Cruiser and set the navigation towards a small town in the vast desert that lines the eastern half of the Golden State. 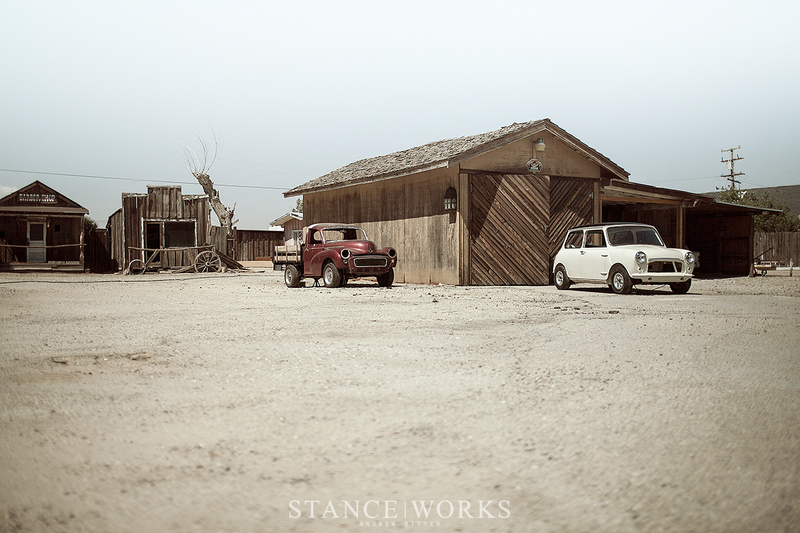 Nestled in a small barn amidst a deserted tourist attraction was a little 1969 Mk2 Morris Mini that had come to a pause partway through a restoration. The body was sorted and a new layer of Old English White coated the panels, but without an engine or an interior, it sat as a shell patiently waiting for someone to kick the restoration back into gear. Being a '69 meant that this Morris came with the external-hinged doors and sliding glass windows that are indicative of the early Mini models that I lusted after, and with its rust free metalwork I knew I had to jump on the opportunity. 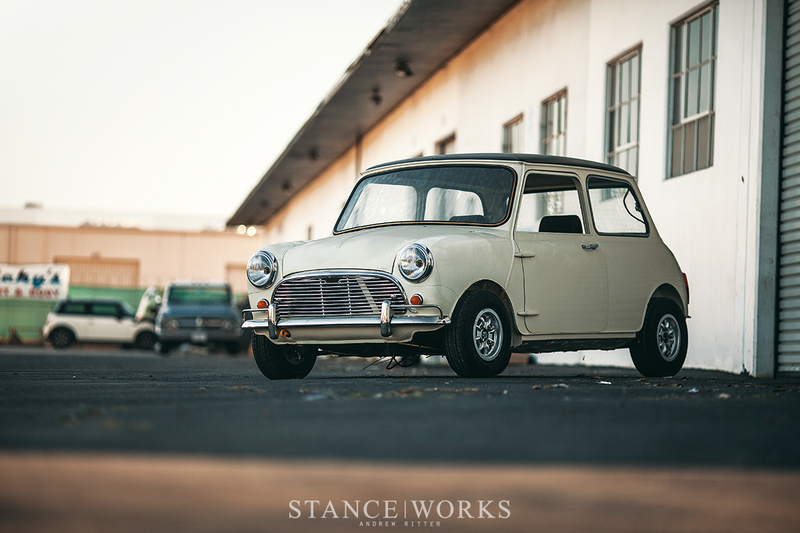 By the end of the day, we had a transport arranged and we were making room for the new Mini project in the StanceWorks Garage. 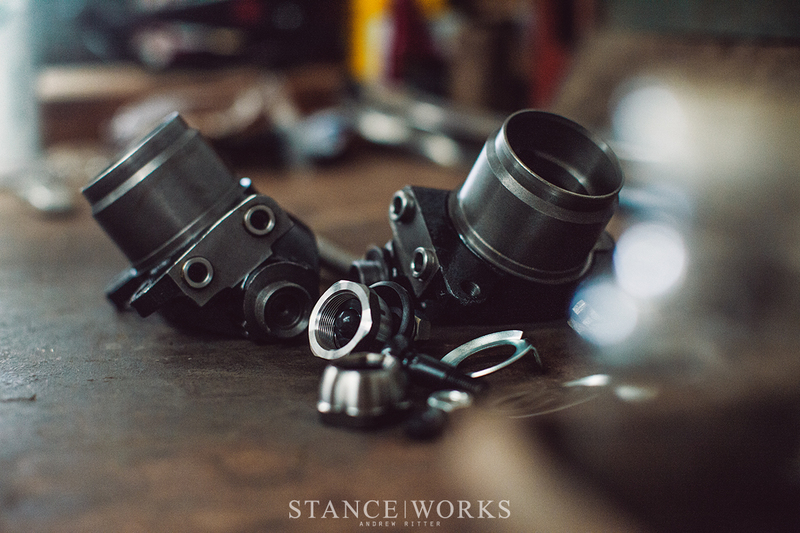 Having a bare shell felt like a wonderful blank canvas to start with, and the completed body meant that I could move straight into rebuilding it, unhindered by any necessary rusty repairs. On the flip-side, however, I began to realize that a bare shell also presented a few challenges. 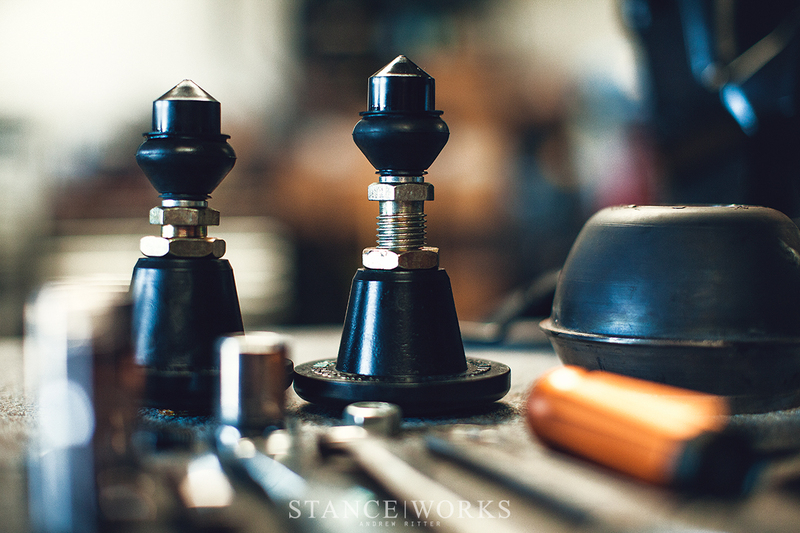 Over the years I've grown accustomed to the strategy of disassembling something, learning how it would all go back together along the way, but with only the bare essentials bolted to my new Mk2 project, I found that I'd be simply filling in the blanks with no previous guidelines. Fortunately for me, the guys at Mini Spares were happy to help. With its founding in 1975, their team has decades of experience in the restoration and racing of Minis, so I reached out to tap into their collective knowledge to see if we could put my Mk2 puzzle back together again. Noah , one of the members at Mini Spares, broke out the parts reference guides and walked me through the random little bits that I'd need to bring life back to my Mini. 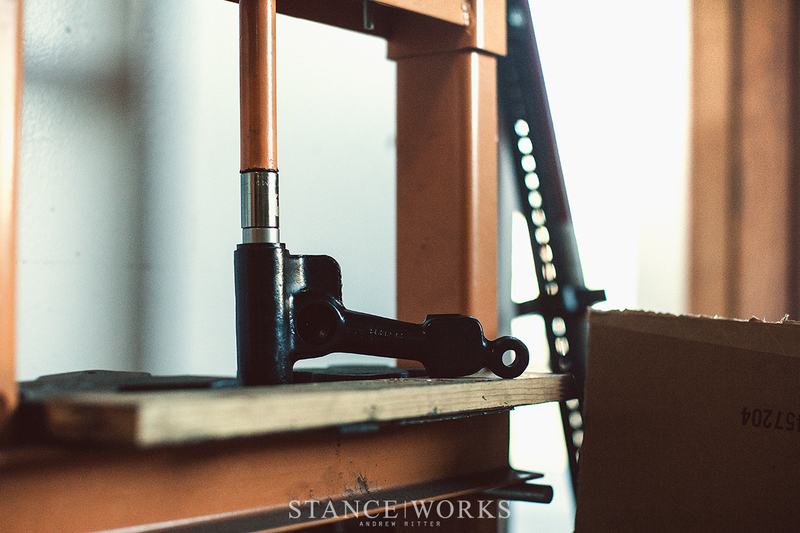 After penning a list of part numbers, I began my wait as the boxes made their way across the Atlantic Ocean. 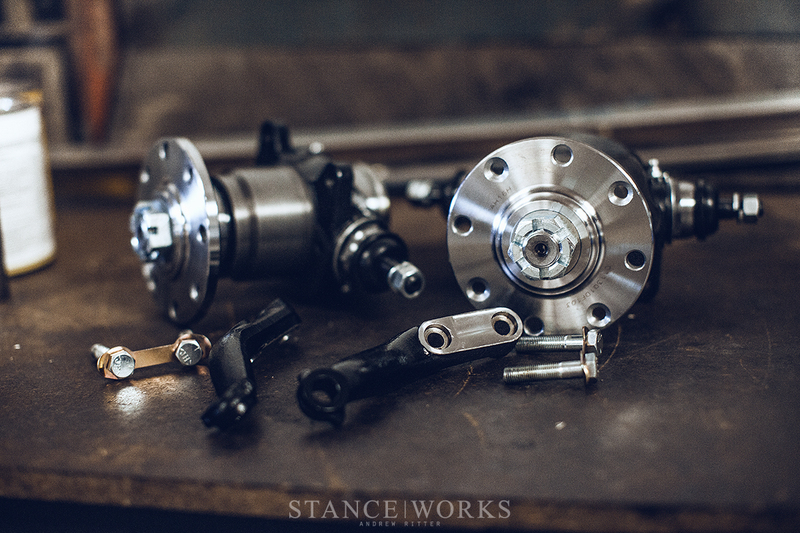 Within a week, the StanceWorks shop space was filled with boxes from the UK. 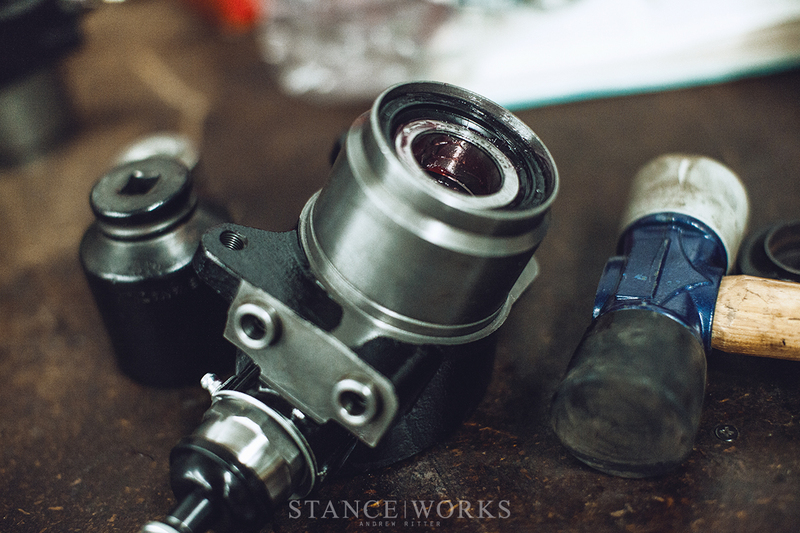 I laid out the new parts and took the first steps in the reassembly. Up front, the Mini received a facelift and a minor backdate, opting for the more understated Mk1 Grill to fit my vision for the build. A pair of Cibié headlights returned a period look to the car, taking the place of a pair of modern buckets that had been bolted in at some point. 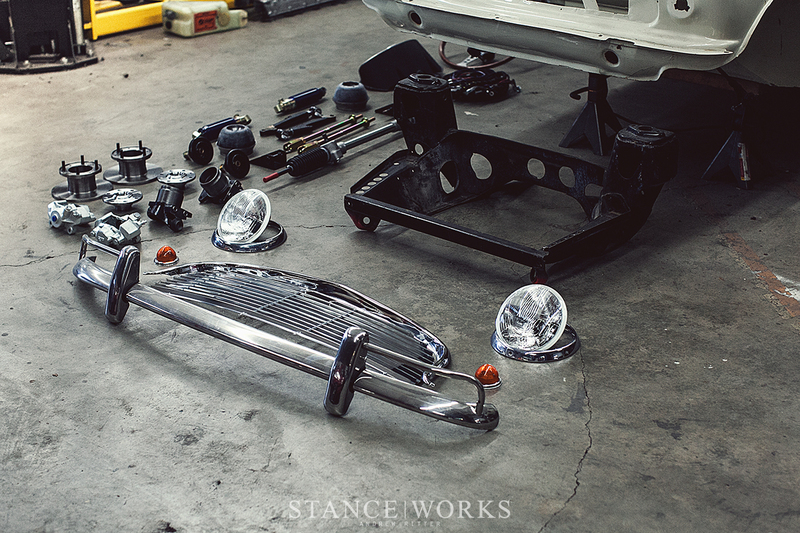 Without any bumpers included in the original sale, I looked through MiniSpare's offerings and finally decided on a set of their stainless steel bumpers with the optional overriders. The overriders and corner bars date back to the early Mk1 Minis of the early 60s which is the era from which I draw much of my inspiration. 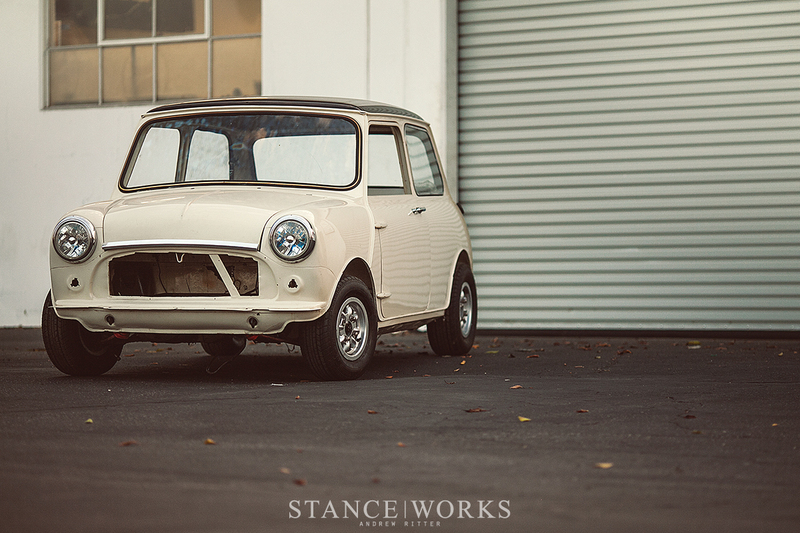 With each new part bolted onto the face of my Mini, it began to look more and more like a real car. While the Mini originally came to fruition solely as an economical means of transportation during a fuel shortage, it's handling prowess led to many racers reappropriating them for track duty. 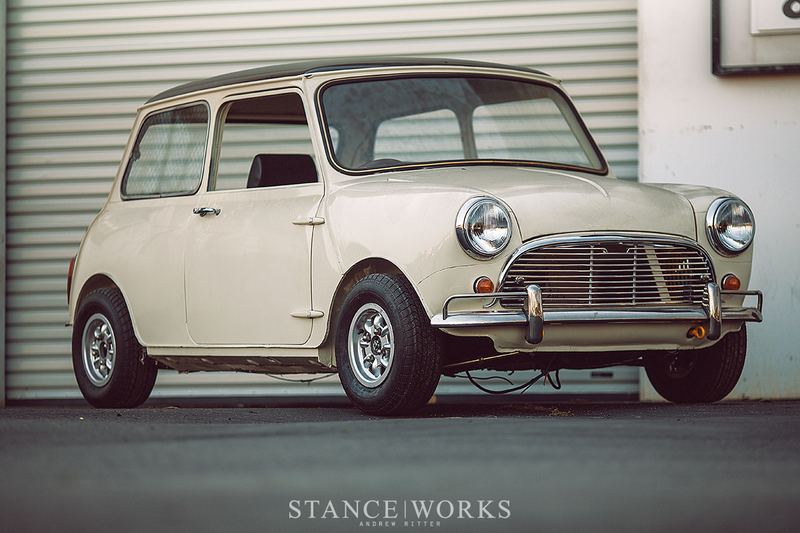 Eventually, the demand spawned the Cooper and Cooper S models that had their purpose set firmly in competition, leading to the development of performance parts for the small hatchback. Naturally, my dreams of Mini ownership are filled with plenty of canyon roads and mountain journeys, so I've turned to the Cooper S for guidelines in building a sporty car to enjoy for years to come. Up front I wanted to replace the standard drum brakes with the Cooper S disc brakes so a set of new Cooper S hubs were sent over and I began to build them up. 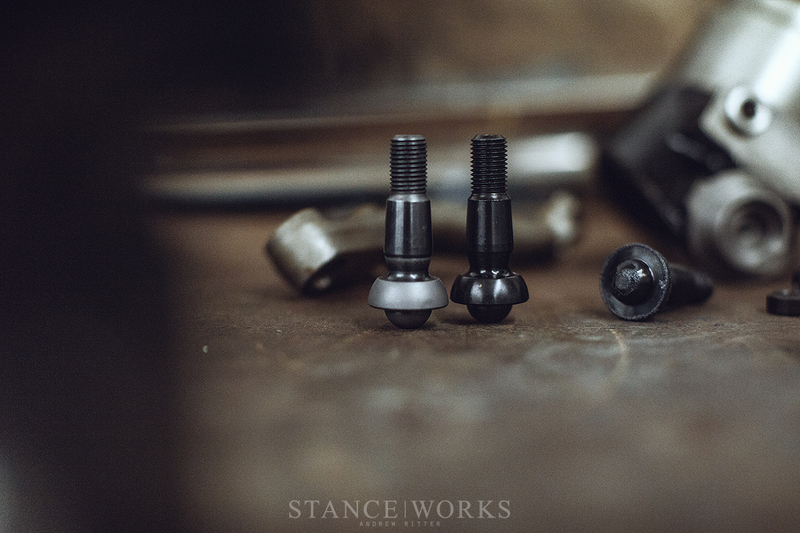 The first step tested my resilience as I patiently lapped the ball joints into their new home, removing the small marks left from machining and ensuring a smooth, fluid motion through their travel. 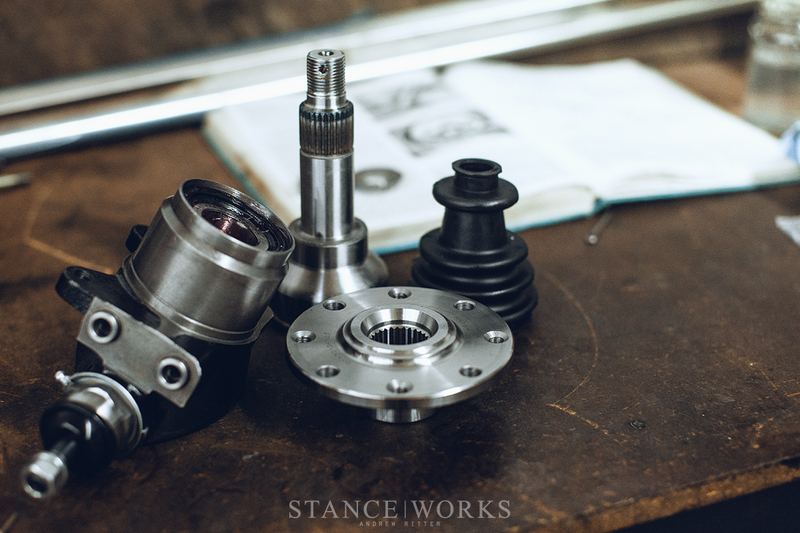 With the ball joints in place, I turned to our press and began to guide the bearings into their tolerance fit. 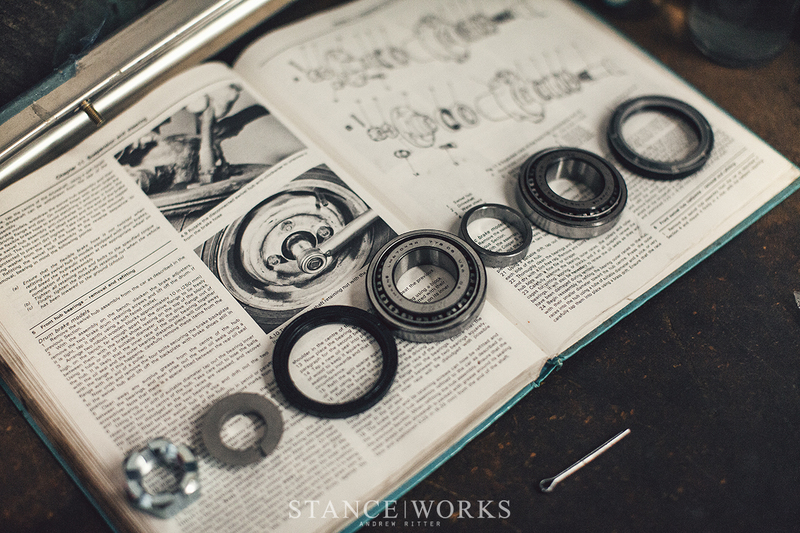 My hands stank with the all-too-familiar odor of wheel bearing grease as I pressed the final dust shields into the hubs. 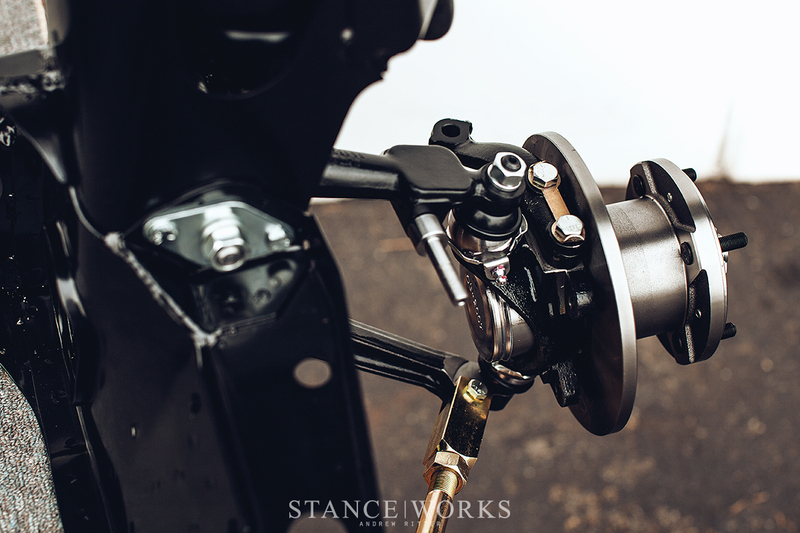 Up top, the steering arms would guide the hubs through the motions, translating the driver's input through the newly installed quick-ratio steering rack. 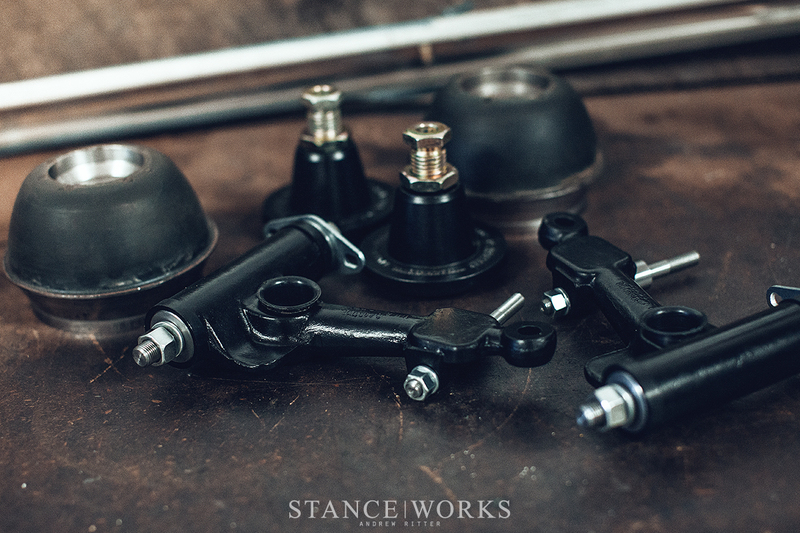 To protect them from the elements and match them to the other suspension parts, I coated the steering arms in a heavy duty Chassis Black before finally torquing them to the hubs and hammering up the lock tabs. Now that the hubs were ready for duty, I had to turn my attention to the subframe that would act as the foundation for the front suspension. 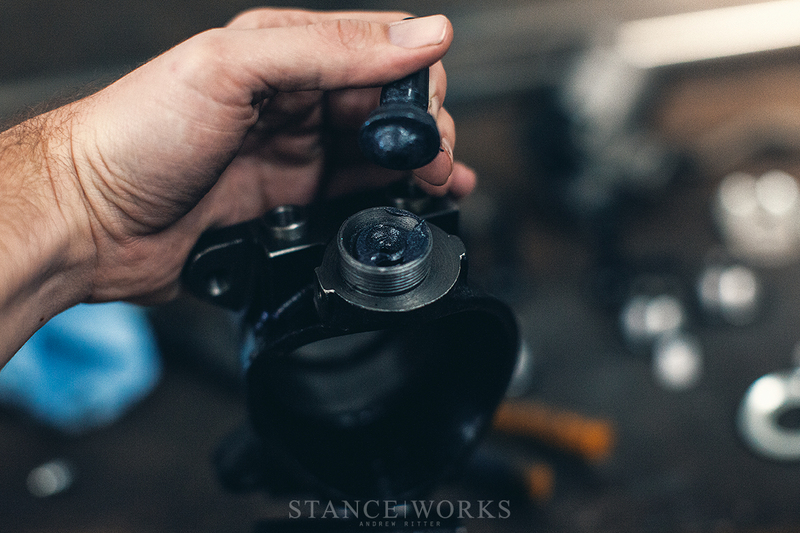 Taking a page from the respected David Vizard, I added gusseting to the front tie rod mounting points with help from Mike on the welder. Along the top I drilled out holes, reminiscent of the lightening techniques employed by British racers of the era. 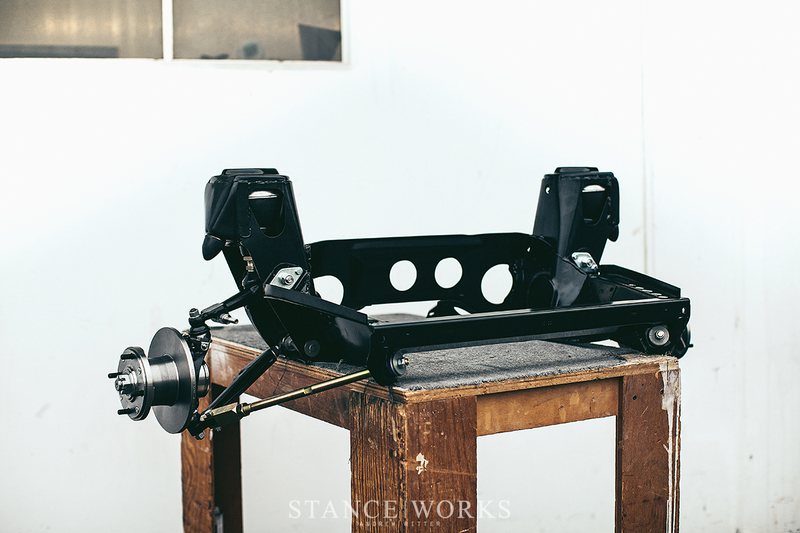 Once the minor alterations were complete, the subframe went out for sand blasting and before long, it was back in my hands with a shiny new semi-gloss black finish, just begging for reassembly. With visions of enthusiastic driving and potential track days, I knew that adjustability would be key in improving on the already impressive handling of the Mini. 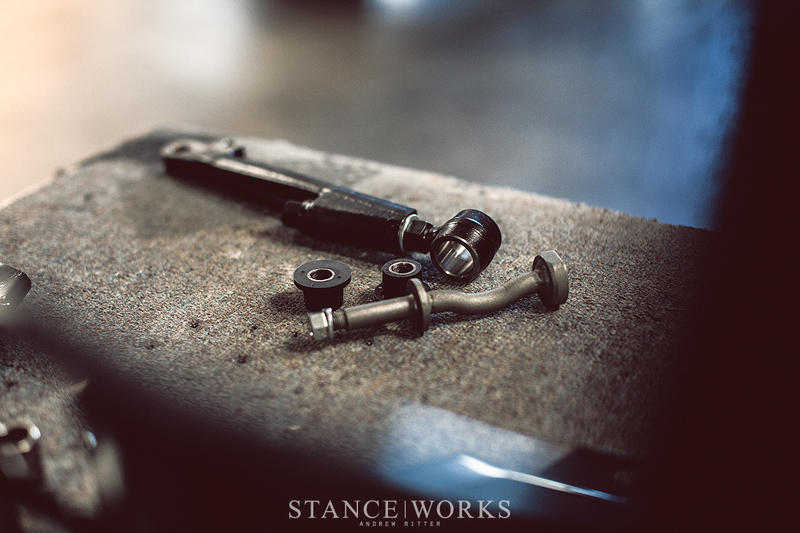 A set of adjustable tie rods, mated with a unique pairing of bushings that MiniSpares has found to be the perfect combination of stiff and soft were bolted to the front end of the subframe. 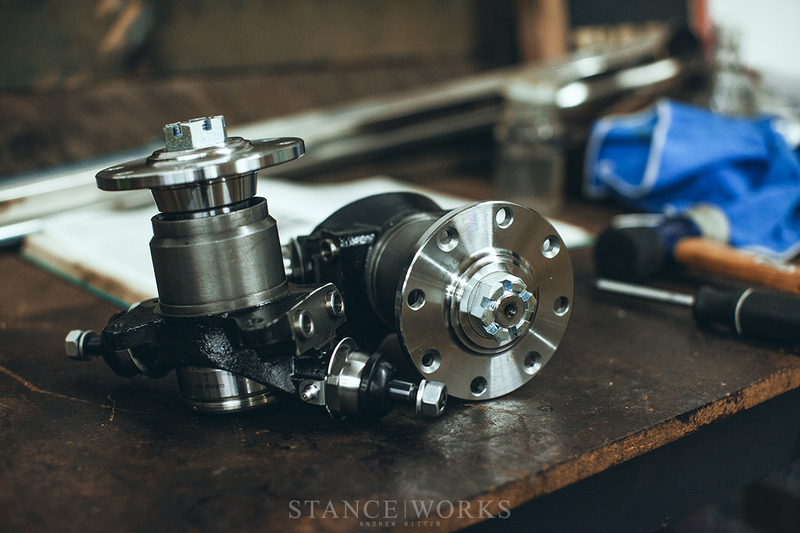 The front tie rods positioned the lower adjustable camber arms that I bolted in, and a pair of offset bushings ensuring that everything will align properly when the geometry is dialed in. Up top is where the Mini's suspension is incredibly unique. In place of the usual metal springs that we're all familiar with, Mini utilized a rubber cone that functions in a similar way. 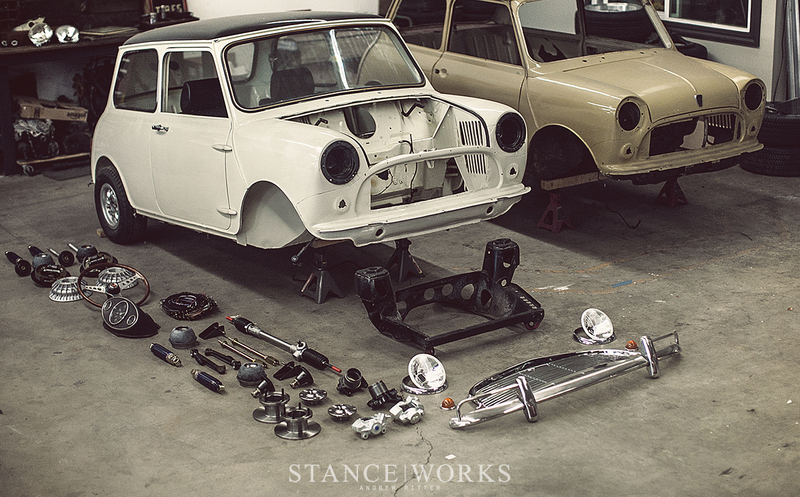 As the Minis age and parts become more sparse, Mini Spares has taken it upon themselves to ensure that quality parts remain available for enthusiasts. Often times, quality rubber pieces are hard to find, but Mini Spares teamed up with a manufacturer to develop a set of rubber cones that could endure aggressive use while providing a performance-oriented "spring rate". I opted for their 'Red Dot' cones which ought to offer a firm road/track ride. In the same way that coilovers offer height adjustments, a pair of Hi-Lo trumpets will give me the ability to spin the rubber cones up and down, fine tuning the ride height. 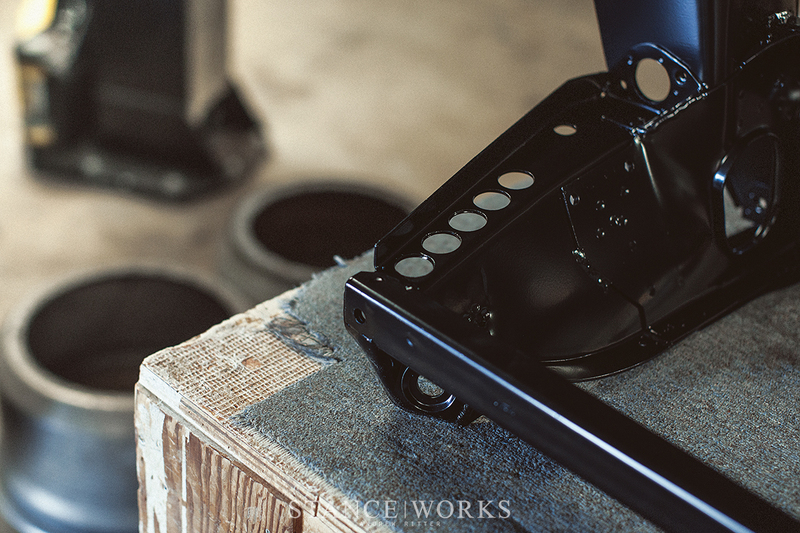 The top arms that would house the Hi-Los received a coat of the heavy duty Chassis Black before being rebuilt with a new set of roller bearings and shaft. 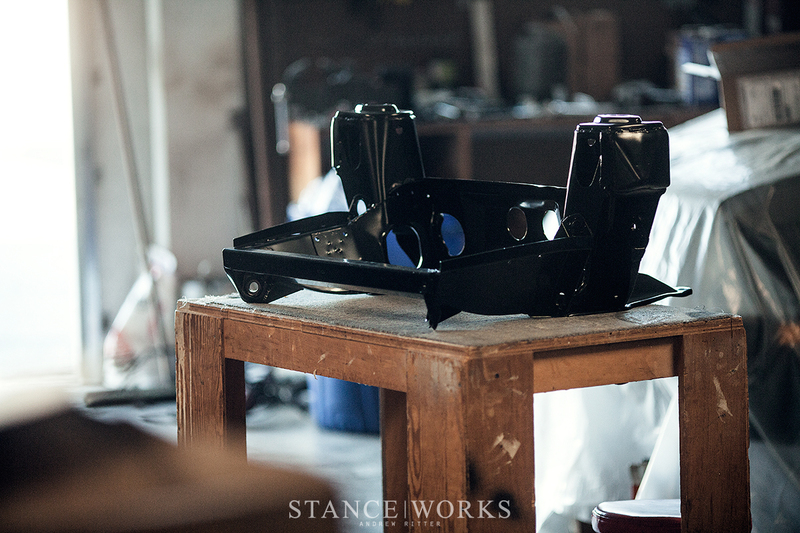 With arms and bump stops bolted on in step-by-step fashion like a large scale model, the front end took shape. 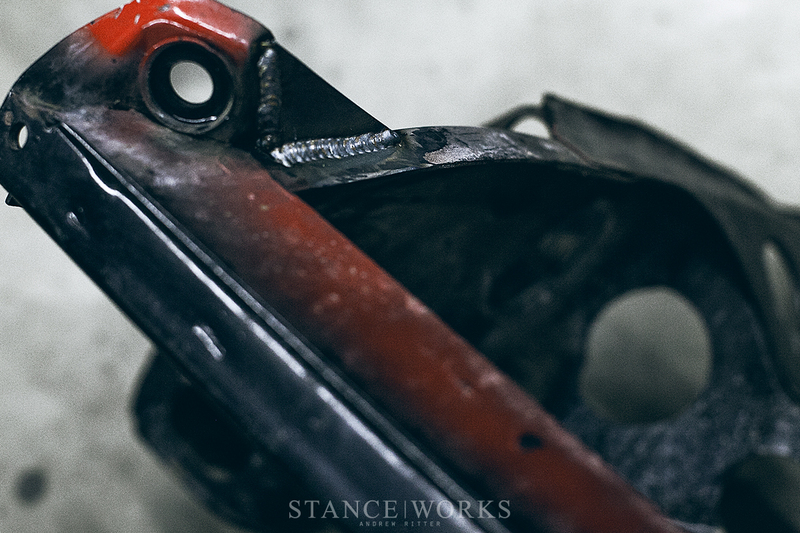 The anticipation was too much to take, so as soon as the final bolts were tightened, I asked Mike for help wrestling the subframe back into its position under the Mini's shell. 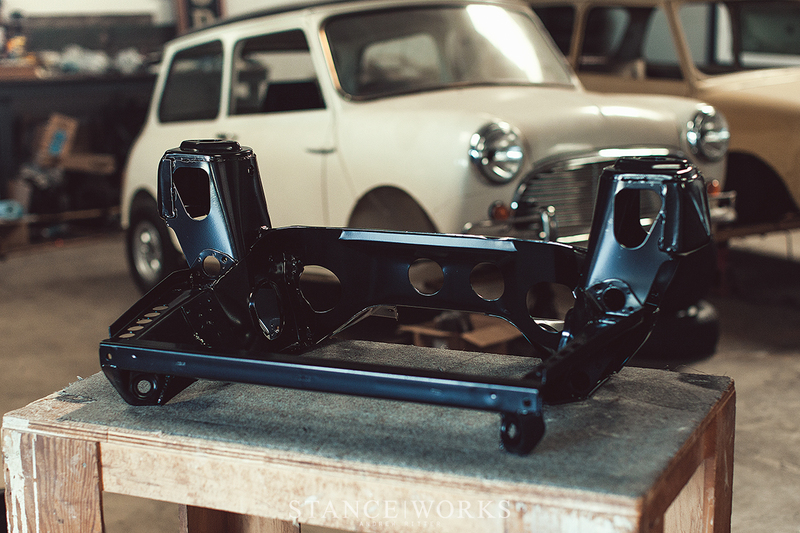 For the past few months, the Mini sat patiently on top of jack stands as I accrued parts and worked on assembly. Now, with its 10" Minilites back underneath it and a newly functioning steering setup, I was finally able to wheel the car back outside to step back and admire the progress. There's still plenty of steps left on the tasks list before I'm buzzing around the SoCal mountain roads, but it's one step closer and I'm more and more excited about it with each day. Now, you'll have to excuse me as I go jump behind the wheel to hum engine noises and daydream about the day it drives once again. 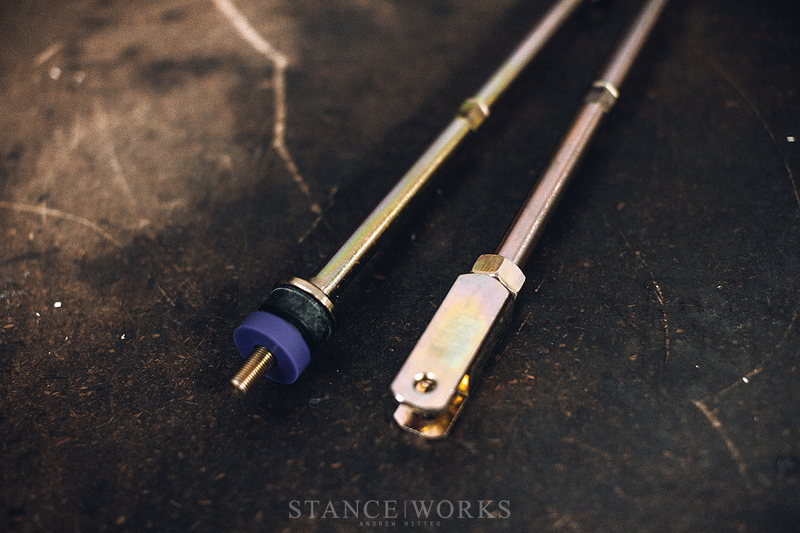 I’ve heard of a british company that produces spring/shocks suspensions kit to replace the rubber cone ones. Can’t remember that name of it though, but I’ve also seen that on the UK TV show Wheeler Dealers when they were doing a Moke. Really enjoyed the Mini content, Andrew – hope to see more as things progress! The only issue to fix on this setup is the spring. When you hit a big pothole there is a chance this spring take off its original place, so it’s kinda of dangerous. I hope you’re fitting a bonnet badge! Can’t wait to join you on those canyon runs! That day will be very special. I’m enjoying these in-depth build articles. Keep us updated it’s very cool to see the progression of a build.